In the 1960s, a 17-year-old boy who stole a car in Hunter's Point, was chased down and shot by the police. This drastic action taken by the police sparked a rage in the youth of the area, who gathered and took to the streets throwing rocks at policemen, smashing windows, rioting against the mistreatment of black youth by authorities. 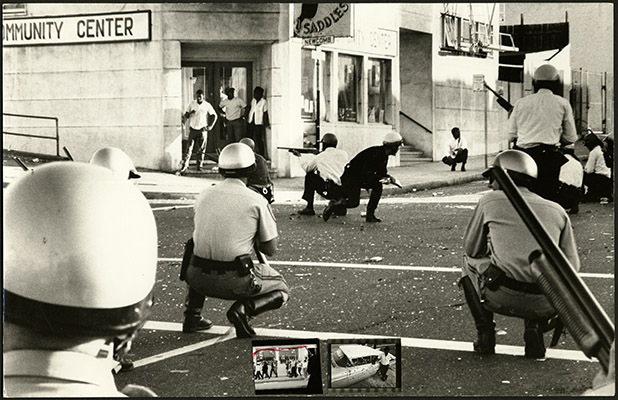 Thomas Fleming, former editor of the Sun-Reporter in San Francisco, recalls his own experience during the riots and his attempts to keep the youth of Hunters Point safe that evening. 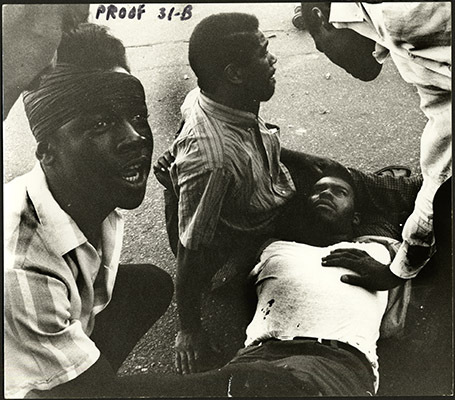 Hunter's Point residents during confrontation with police violence, September 1966. 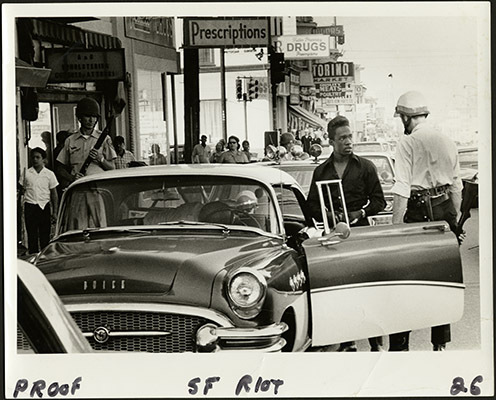 "During the 1960s there were riots in some cities. The carryover here was, they called it a riot out at Hunters' Point. A policeman had shot a 17-year-old kid who had stolen a car. He was out joyriding like a lot of other 17-year-old teenagers do. They steal somebody's car and cops were pursuing the car. When the kid got out there in that part of Hunters' Point, where it happened, he jumped out of the car and ran across a vacant lot. The cops told him to 'Halt' and of course he didn't pay any attention to that. That's what started the shooting. The teenagers started saying it wasn't fair for that boy to be shot like that and they started gathering out there on the streets, and that's when we first started hearing about it. Because somebody out there was calling Nat, they were calling the NAACP to let them know what was going on. There was more policemen on the street out there at that time. The kids would be away from the cops and they'd throw rocks at them. And as the day progressed, it got worse. "I remember when that thing occurred. It was coming over the news on the radio. We'd heard about it out here. Burbridge was still president of the NAACP. He came by the paper because we were right over here on Turk Street then and asked me if I would like to go out there with him. I said sure, I'd like to go. So we went and there were a lot of angry young black males out there. They were demanding to see the Mayor. Jack Shelley was Mayor then. So before we left them out there, Nat Burbridge called the Mayor's office and said he thought it would be good for the Mayor to come out there and talk to those kids because most of them were teenagers. He refused. 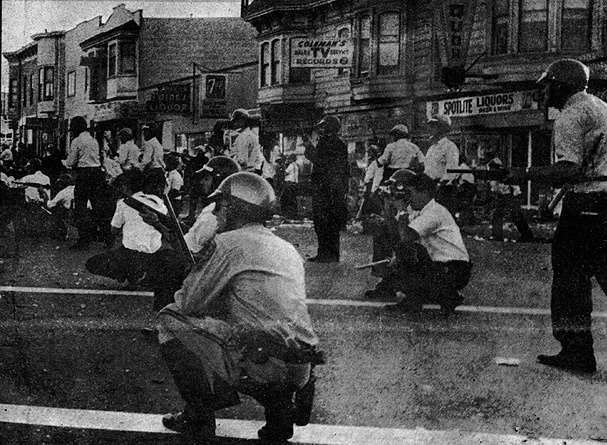 Riot police draw guns on residents during 1966 riots on 3rd Street. "Well, when we got to the police station we saw a car overturned, burning out there on Third Street. They smashed out a lot of windows out there along Third Street. And it looked like there was another fire further out, and they were still out there throwing rocks. Well the police were trying to halt it, but it looked like they weren't doing very well. So the Mayor decided that he would go over there and address them. Police question bystander during the three days of upheaval in late September 1966. "They went over to that old Opera House out there on Third Street. That's where the kids were all gathered over there. All of us who were in the police station went over there. When we walked in, they started yelling, cursing the Mayor. When he got up on the stage, they started throwing eggs at him and vegetables (chuckle), and he couldn't make a speech, so the Mayor ducked out. Well we knew it was going to be even rougher later on. So we came back over to the police station and we heard that Pat Brown--he was governor then--was going to come down from Sacramento and go meet with the Mayor and everybody else at the Hall of Justice. We went over to the Hall of Justice and the governor came in and that's when he decided to call out the National Guard. I told Nat, 'It looks like we're going to be up all night.' Because most of these Guardsmen are 19, 18-year old kids, and they're scared. I said, 'They'll shoot!' I said I think we ought to start patrolling the streets. So we went further out on Third Street trying to tell them, 'The National Guard are coming out here, if they tell you to get off the streets, get off the streets.' We went out to Sunnydale and did the same because they were all out there on the streets. Then we came over to Haight Street, there were a lot of black kids out there. Told 'em, 'Get off the streets if the Guard comes in.' And we went along Fillmore Street and it wasn't long after that we saw these jeeps patrolling around with a machine gun mounted on the back! We knew that they meant business. So we stayed up until about 4 o'clock in the morning before we went home. I don't think he declared martial law, but he called out the National Guard to restore order. "I think the Guard was pulled out after three days." 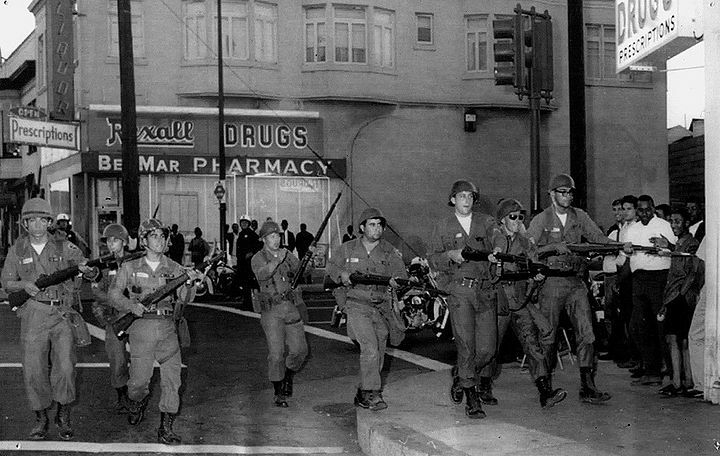 Police storm Hunters Point in force during 1970 arrest attempt. 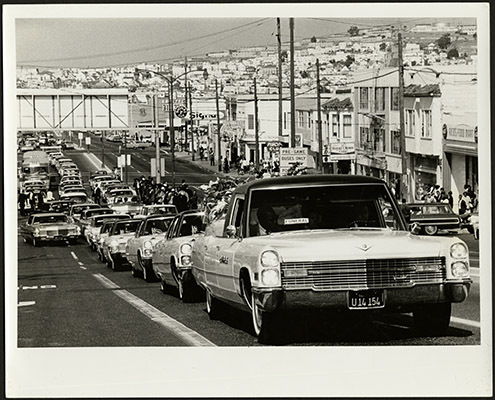 Matthew Johnson Jr.'s funeral procession on Third Street after the 1966 revolt. --Thomas Fleming, 91 years old, former editor of the Sun-Reporter in San Francisco, 1944-1994. Interviewed on Saturday, January 9, 1999 at his home on Fillmore Street in San Francisco by Chris Carlsson, with assistance from Caitlin Manning, Joe Caffentzis and Max Millard.